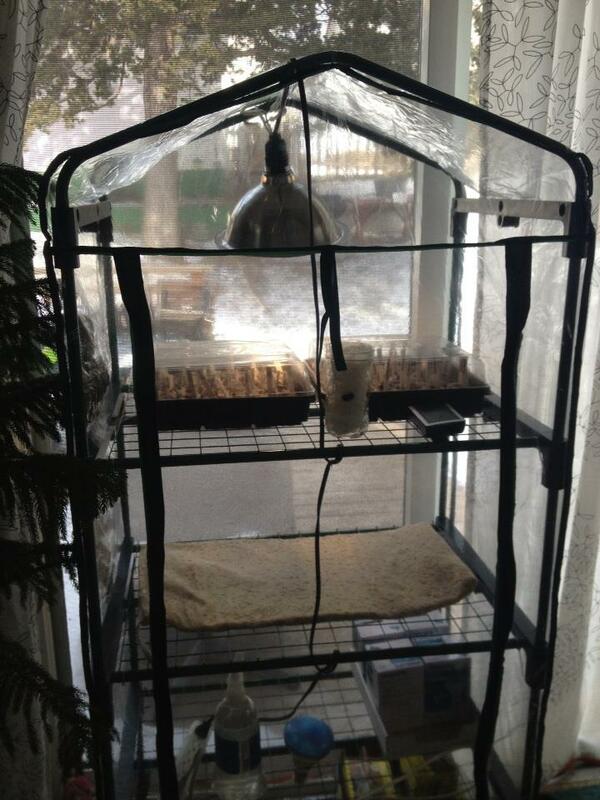 This is our greenhouse set up. It’s killing me a bit to have the light on constantly, but I have convinced myself that it will all equal out in the end…. Anyhoo. The set up. We picked up the greenhouse at Home Depot for $25, four flats of Jiffy Seed starter greenhouses and “plant” light bulbs for our clip on laps (scavenged from the studio.) We also stuck a heating pad in the greenhouse, not under the plants because it’s a people heating pad, not a plant heating pad. So, with the addition of the heating pad, the lights are keeping it about 70-72 degrees in the greenhouse. Kiddo helped me plant about 5 seeds before declaring that it was “boring” and wandered off. I guess planting inside is not as exciting as casting about seeds outdoors. Oh well. She and I started two scarlet runner beans for her, so she can watch them grow. I will post photos of that later. Super cool, although I am beginning to suspect spring is never going to arrive here. Are you turning off the lights for a few hours at night? I could be misremembering, but I think once the baby plants have emerged they need a diurnal cycle to grow into healthy well-adjusted plants. Right now I’m just keeping the light on for the heat – they need to be kept pretty warm until they start germinating. Once that happens I will only keep the light on them during the day.